Chem. Sci., 2015, 6, 3102–3108. This paper reports a series of comparative experiments on the activity of carbon- and oxygen-centred radical species in a model reaction of radical addition of THF to imines mediated by a series of zinc alkyl/O2 reaction systems. The study strongly contradicts the notion that generally R• radicals are the initiating species in organic reactions mediated by RnM/O2 systems and simultaneously demonstrates that oxygen-centred radical species are the key intermediates responsible for the initiation process. 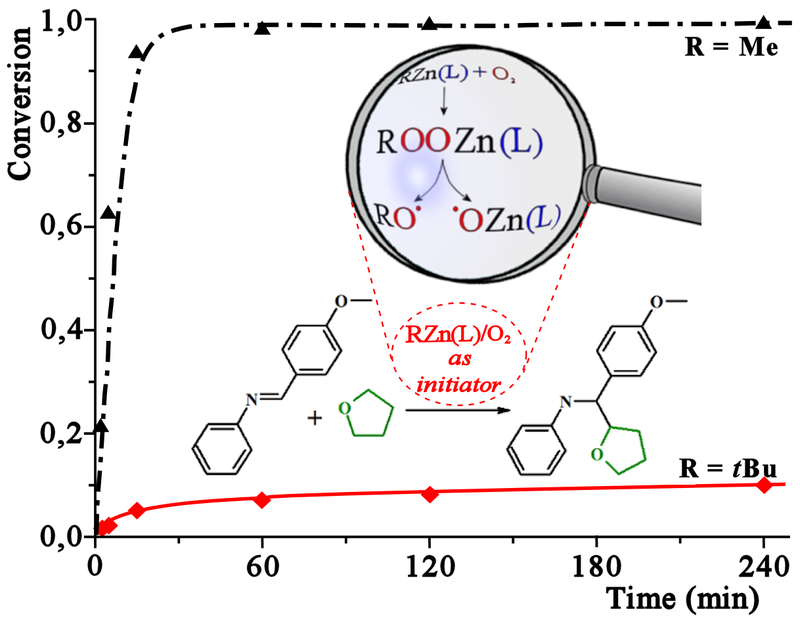 In addition, a new efficient RZn(L)/O2 initiating system for radical organic reactions exampled by a model reaction of radical addition of THF to imines is developed. Moreover, the isolation and structure characterization of the first zinc alkylperoxide supported by a carboxylate ligand, [Zn4(μ3-OOtBu)3(μ4-O)(O2CEt)3]2, as well as the novel octanuclear zinc oxo(alkoxide) aggregate with entrapped O–THF species, [Zn4(μ4-O)(μ3-2-O–THF)(O2CEt)5]2, provide clear mechanistic signatures for the mode of the RZn(O2CR’)/O2 system’s function.